This Deployment Case is specially designed to fit the TS-1E Degausser together with the IRONCLAD Erasure Verification System. This heavy-duty, impact-resistant shipping, storage and transportation case with custom moulded interior padding will ensure your Degausser and IRONCLAD system are protected when moved from one location to the next. Set on casters, you have the freedom to move the degausser to the media. The Garner TS-1E Degausser with IRONCLAD is an NSA Evaluated and Approved High Security Degausser which meets the CESG Higher Level requirements and utilises Garner's proven solid-state technology. The TS-1E IRONCLAD model features Garner's IRONCLAD Erasure Verification system with Image Capture, which provides complete documentation that data has been completely eliminated. The TS-1E comes complete with Scan-1E scanner included. The IRONCLAD system captures and records images of the degaussed media. The bar-code scanner scans the serial number of hard drives and the machine documents the operator ID, date, time and erasure status of the degaussed hard drive. The IRONCLAD system then generate an erasure report with images to be used for audit purposes. The TS-1E IRONCLAD provides a 20,000 gauss erasing field ensuring complete Hard Drive and Tape erasure of classified and "Top Secret" data within 45 seconds. Garner's built-in magnetic field verification system along with onboard diagnostics, confirm the field strength of each and every erase cycle guaranteeing complete erasure every time. Redundant error checking before, during and after each erase cycle ensures the TS-1E IRONCLAD is performing in peak condition. Compact and portable, the TS-1E IRONCLAD can be easily transported to the location of the media for on-site erasure and de-classification. 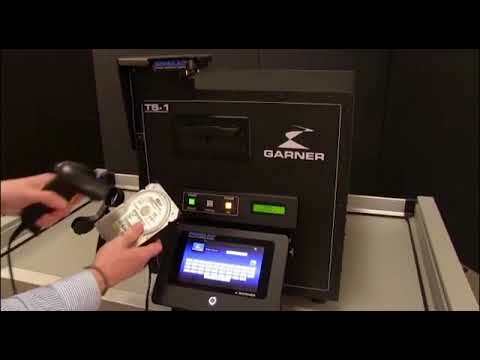 The Garner TS-1E IRONCLAD is the newest and most innovative product in the Garner line of degaussers. With 2 Tesla (20,000 gauss) of power, the TS-1E IRONCLAD erases the highest coercivity magnetic media available today. It erases 5,000 Oe hard drives (laptop, desktop and network up to 1" high) and up to 2,800 Oe high coercivity tape media, including all formats of LTO (1,2,3,4), SuperDLT I & II, DLT, AIT, 3590 Series, 8mm and more, all without any adapters. With a continuous duty rating (no cooling breaks necessary), quiet operation and a 45 second cycle time, the TS-1E IRONCLAD offers a fast, cost effective erasing solution for Top Secret data. The TS-1E IRONCLAD is exceptionally user-friendly. Simply place your media into the drawer and push the "Erase" button. Within 45 seconds, the media is erased allowing you to open the drawer and remove the media. The IRONCLAD system comes with an easy to use touch screen control head, stylus and bar code scanner. Built in safeguards check the stored power before each erase cycle ensuring complete erasure every time. In addition, a proprietary gauss sensor measures the erasing force in the coil at the time of discharge. If the electrical power or the erasing force is less than specification, the machine will report an error message to the operator and not complete the cycle until the TS-1E IRONCLAD meets both power and erasing force requirements.